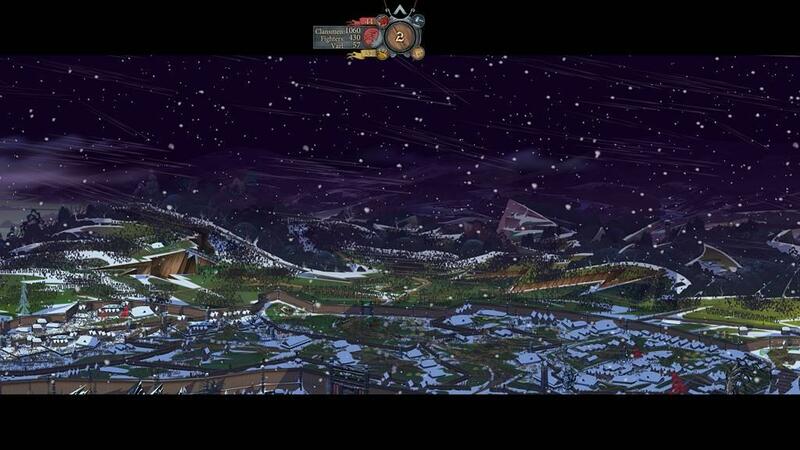 The years have been both kind and unkind to The Banner Saga. It’s been only four years or so from the launch of the first game [Gaming Nexus score: 8.8 out of 10] to the second game [GN score: 8 out of 10] to what will be the launch this July of the third. Four years is a perfectly reasonable length of time to wait for a planned trilogy. Yet those four years have felt like a lifetime. Who are these characters again? My eyes move from portrait to portrait, trying to remember the stories of the humans and giants. There is also a stony people called the dredge, and almost the entire map is devoured by a world-eating darkness. In general, it’s not looking good for anyone involved. Me trying to recall their struggles as a displaced people amidst an apocalypse is one thing, but recalling their battlefield bonuses as these crabs claw their way out of a bucket is another. I’ll have to rely on developer Stoic Studio to refresh my memory every step of the way as they close the book on this Vikings-meets-Oregon-Trail series of inventory mismanagement and tactical turn-based combat. So, it’s just like human nature—sigh—to be running from an extinction level event but have no solution except to start killing each other off. It’s a tale as old as time...cue the Beauty & The Beast soundtrack. I haven’t even gotten my bearings, storywise, before I’m lining up my forces on the checkerboard field of battle. A large censer is kicked over in the middle of the board, and the fire starts spreading with alarming speed. One minute the board is free and clear. The next minute, though, I have a couple of my warriors roasting like marshmallows in the middle of the enormous hall. 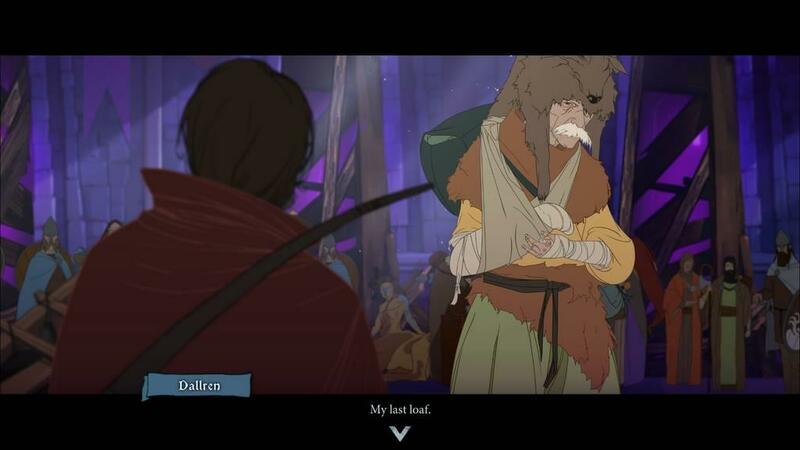 The Banner Saga 3 begins with the human capital swamped with tent cities, neck-deep in a refugee crisis. Everyone is either running from or perishing in the darkness, and this is land's end. The crowding is palpable in the city. Feels like my hundreds of clansmen are rubbing shoulders with thousands of others. This is unsustainable. There can’t possibly be enough food, water, and shelter available, even with what little is left of humanity. But the game also thinks I remember the bit players. I’m required to make branching decisions on whether to protect one person or join the fray with another, and I sure as heck don’t remember why I’d do one or the other. But when all is said and done, I suppose it doesn’t matter. It’s the end of the world. All bets are off. Despite any debts I owe—or am owed—I’m just going to do whatever is smart in the moment. Or perhaps I’ll just follow my heart. There’s no telling. And that’s setting the stage for some intriguing encounters. You have to fill in some of the narrative-gameplay gaps yourself. One particular character “came to my aid” in a fight. Unfortunately, that character ran onto the stage and didn’t actually have time to accomplish anything useful; I’d finished off the enemy on my own. Yet, after the fight, we launched into a conversation where I praised him for his combat acumen, telling him that if he continued to fight like that, then he may sew his banner to mine, joining my caravan. 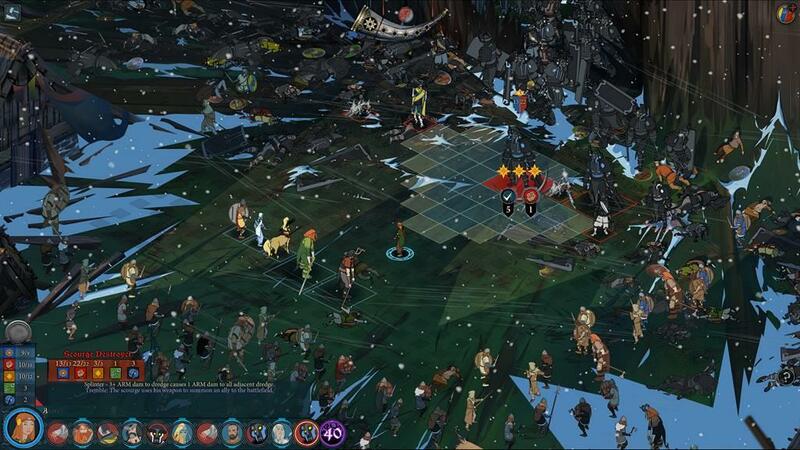 So, my Banner Saga pushed forward, even if the gameplay and written elements didn’t align 100 percent. I couldn’t complain too loudly. It's always good to have more swords by your side. So here we lay our scene, at the top of the hill, upon the great black stones of the capital city, backs nearly pushed into the ocean, taking in a little bit of sunshine in this calm before the storm. I weigh the importance of the flashing icons on the screen. Whether to promote my heroes now or wait until the next battle. To purchase trinkets at the market or find rest even before speaking with the king’s captain of the guard or my slow-burn romantic interest (if I’m even remembering correctly). An uneasy celebration springs up out of seemingly nowhere in the capital city, while the mages push hopelessly towards the center of the growing darkness. Even I have no idea what they plan to do once they get there. 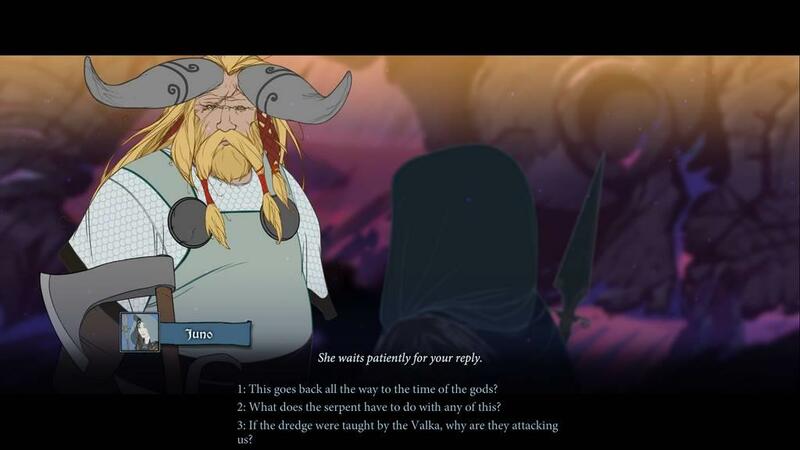 I have a feeling that The Banner Saga is very much willing to let things end in disaster, should I make poor choices along the way. This continues to be one of the finest visual-novels-plus-tactical-combat games I've ever played. It’s not always the most compelling combination. But sometimes its style and grace is irrefutable. 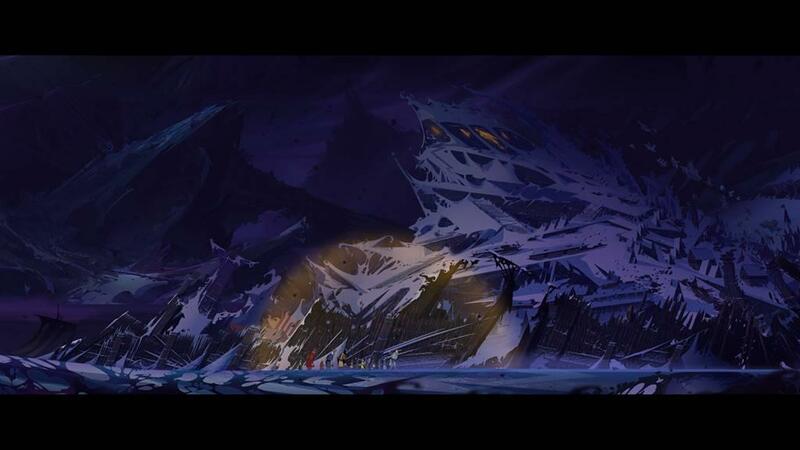 Eyvind Earle, the great American illustrator who painted the most beautiful backdrops to ever grace classical Disney screens, is still the rich influencer behind The Banner Saga’s artwork. His DNA is still all over this series, front to back. 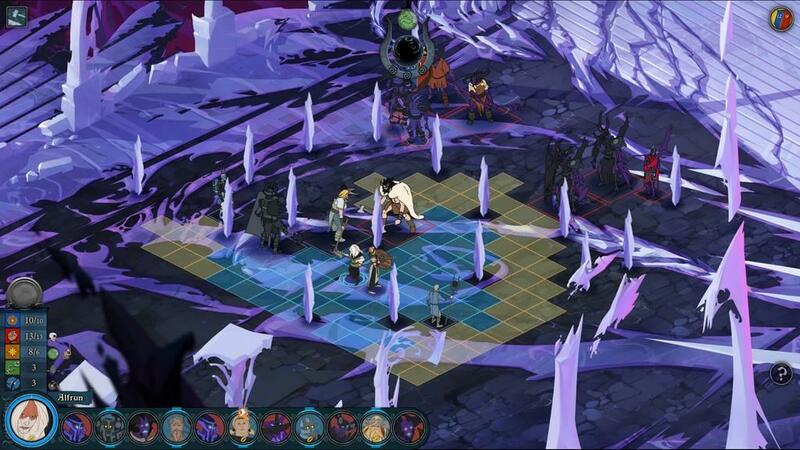 And while at least one recently released game, Ash of the Gods, has tried replicating The Banner Saga’s formula to some extent, all that Ash of the Gods proves is how strenuously difficult it is to pull off what Stoic Studio has done here. 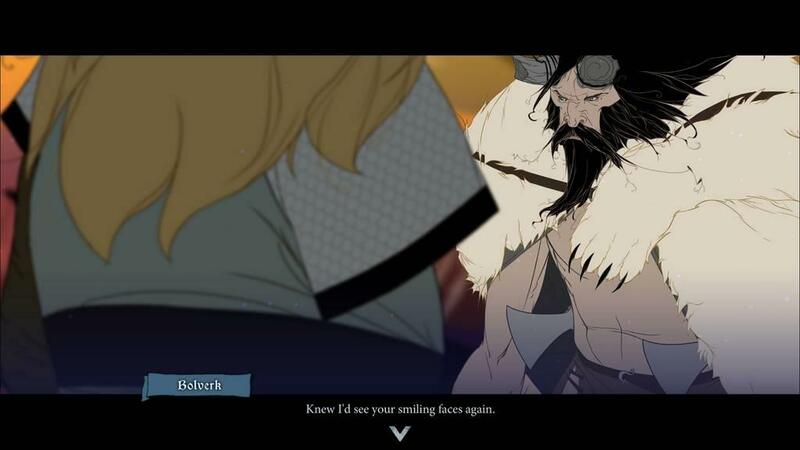 I don’t want to disparage other works that would emulate The Banner Saga, but it’s becoming increasingly apparent that this game is going to do this first and do it best for many years to come. But the visual style is not where the series’ stunning aesthetic stops. 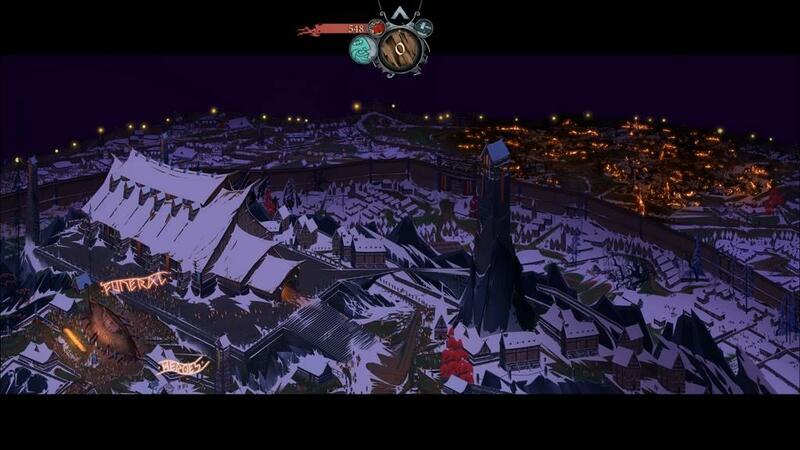 In a game with such a fantastic visual style, it packs tremendous punch in its audio style, too. There are not many well-known video game soundtrack composers, but Austin Wintory is almost certainly one you’ve heard of before. 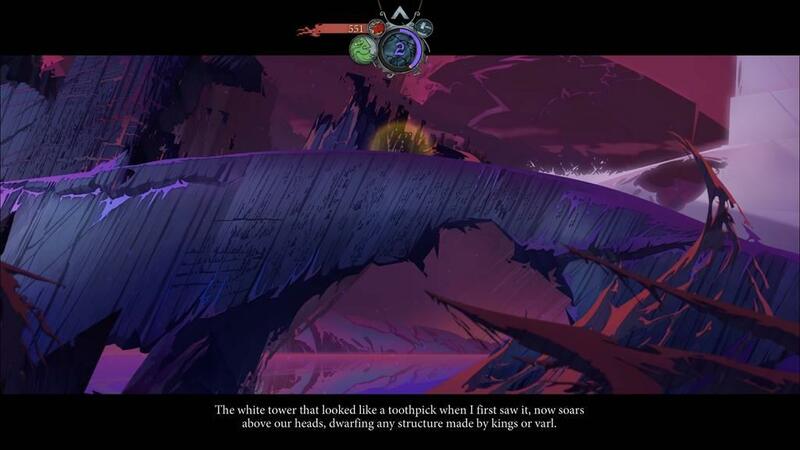 Wintory is here, at his most discordant, at his most unhinged, and at his most menacing. 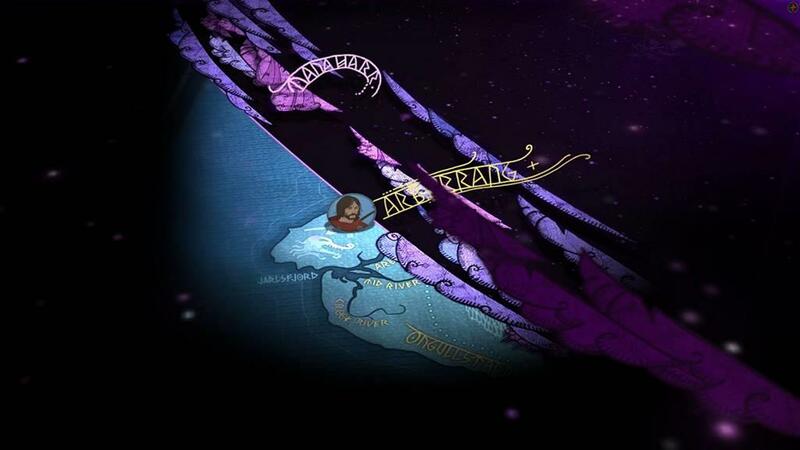 His music has been broken and sewn together like The Banner Saga’s thrashed landscape. My wife even looked up from her book she was reading on the couch and asked, “Is this the music to a video game? Nice.” She never likes any of my other music. 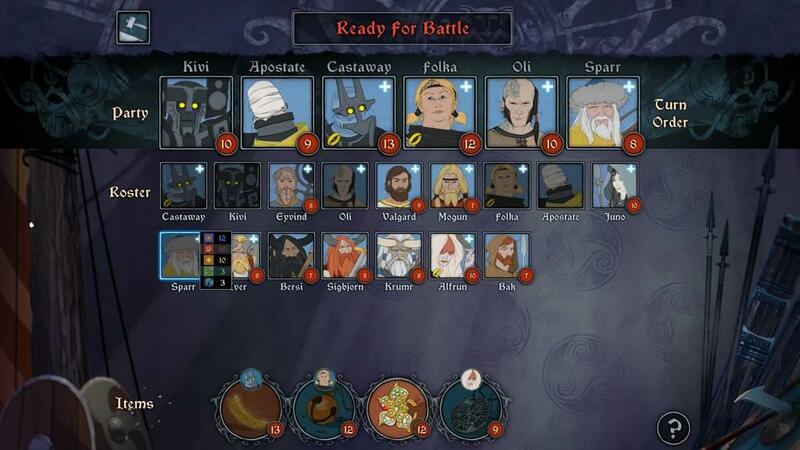 If you've played The Banner Saga 1 and The Banner Saga 2, your choices will carry forward into The Banner Saga 3. 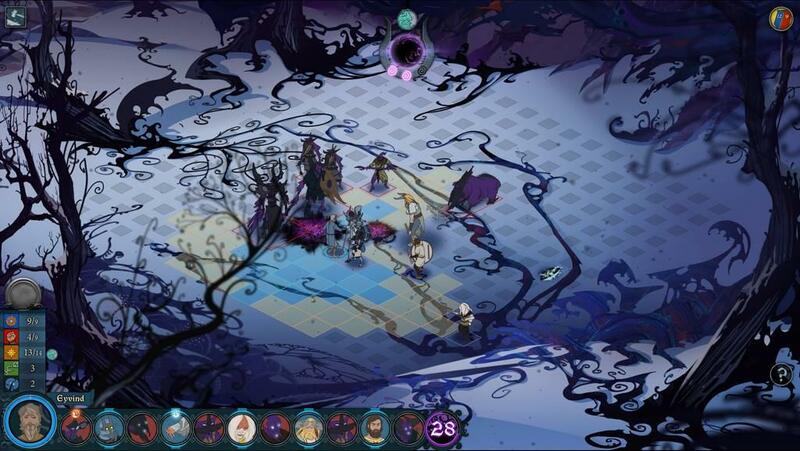 But if you haven't played the first two (or if you're jumping platforms and your saved games are elsewhere), you can still play The Banner Saga 3 as a standalone product without penalty. It’s time to finish this fight. As fragile as the good guys’ hope seems—and it’s not much more than a candle in the dark—I’m looking forward to wrapping up this tale. For better or for worse. For good or for evil. This has to end. 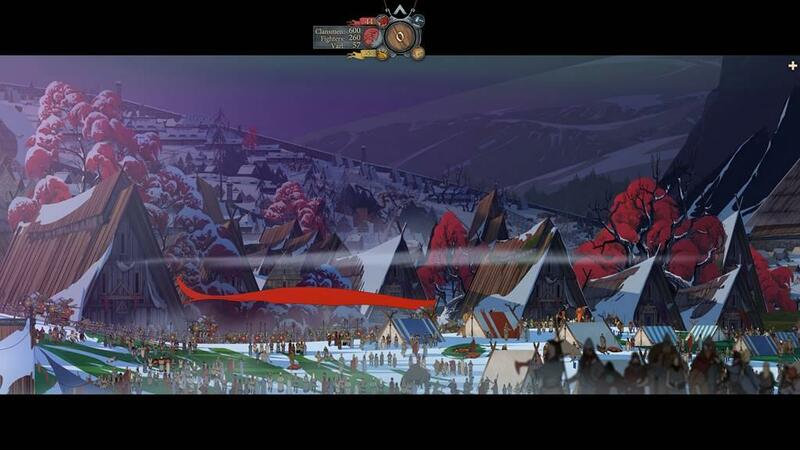 As wonderfully put together as The Banner Saga is, I’m not sure I can take much more of it. Our full review will go up when the game launches, July 26.